This is a new feature that i am starting today on the blog. I shall be sharing what i love right now and links that i have found that are just wonderful. This week, i am obbessed with wild flowers. I made a garland out of an old wildflower book i found at a car boot years ago. I have also taped up flower pictures around the house to give the house a summer feel. 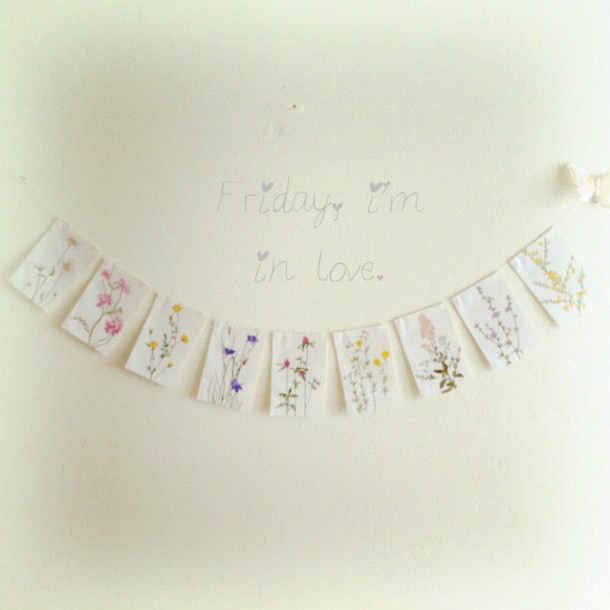 I have fallen head over heels in love with this little blog. I shall be sharing Hanna's love story next week. Elle NEEDS these and mia NEEDS these. We are hoping to get some time to do this DIY project soon. I have a few weddings booked to take pictures at and i have been scouring the web for inspiration. i just love this wedding and this wedding video. My husband has asked me to dye my hair dark. When we met, i had dark brown hair and then i had black hair for a year or so. i have had my hair this colour for three years now and i am a bit nervous about going dark again but im seriously considering it. Maybe i might just do a golden brown as a compromise. The moccasins (sigh!) the cutest! And if you do dye, don't go too dark! arn't they so cute. i would love a pair of the thunderbird ones myself but they are so expensive, even second hand!